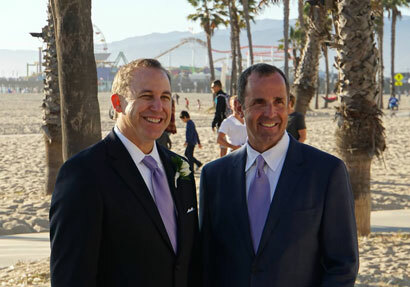 Yesterday I had the honor and pleasure of acting as best man for my great and longtime friend Peter, in a beautiful wedding ceremony at Shutters on the Beach in Santa Monica. 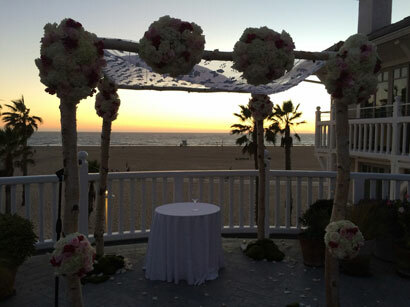 It was a fantastic event, a chance to hang out at a wonderful resort and to see many old friends and make some new ones, a time to laugh and dance, and most of all a celebration as two people who genuinely love each other vowed to spent the rest of their lives together. It was a Jewish ceremony, thought light on religious dogma and nicely updated to the 21st century, and I thought the rabbi did a great job. Along with the joys of marriage she spoke of the challenges in any relationship, and in a nice turn of phrase referred to the need to "give each other space without creating distance". It's interesting to ponder; I agree that's crucial to making a long term relationship work, although I hadn't thought about it quite that way. It's sort of equivalent to letting the other person be who they are, while still appreciating and supporting them closely. The best thing about weddings and funerals and other people's life events is the way it gives you a chance to think about your own life, and put it into perspective. I can't say I've enjoyed all the funerals I've been to (and fortunately I haven't been to that many) but surprisingly they each seem to have left a philosophical mark. Weddings are of course more fun - though often just as stressful - and they, too, leave an impression that lasts long after the details have faded.